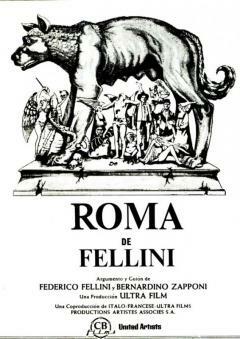 Early in the ‘30s, a young man who’s staying at a boarding school run by priests imagines Rome based on his teachers’ statements and the Fascist regime’s rhetoric. In 1939, when he turns twenty, he goes to Rome and discovers the city’s real nature: people living in a cheap hotels, popular restaurants outdoors, children playing on the streets. 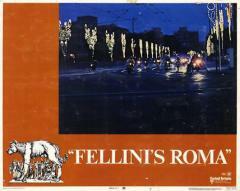 Then, in 1972, there are massive traffic jams in the ring-road, and Fellini is shooting a film in a city crowded with tourists. He’s criticized by young people who claim is not interested in politics. This reminds us of a small variety show theatre, where viewers are running away because of an air-raid warning. Then the scene is set at an underground construction site, when works have to be stopped because some archeological remains are found. 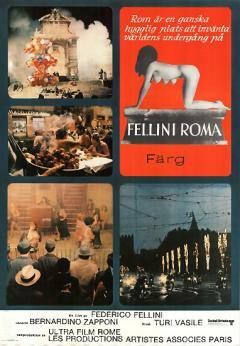 Then hippies gathering in Piazza di Spagna are shown, followed by the clients of a brothel in the Forties. There is also a clergy fashion show, a party in Trastevere (“festa de noantri”), and a real mess, with policemen clubbing people and bikers riding in the night. ‘In short, the impression you get of this city is only one: ignorance. Rome is inhabited by ignorant people who don’t want to be disturbed, and I think the Church is responsible for this. (…) An ignorant who loves his family. This man is (…) a grotesque ‘grown-up child’ who is honoured by the Pope continuously spanking him. [...] he has no curiosity, and he does not believe that you need to be curious (…) This peculiar atmosphere stems from the fact that the Roman fathers and, the Roman mothers act like nurses, as it were. Romans do not pay their children any simpering compliments. They simply tell them: ‘You have a cute face, it looks like your buttocks’. 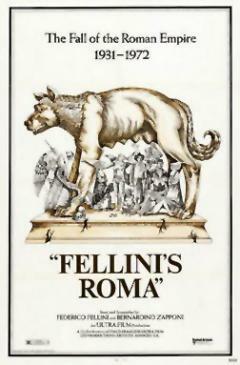 When we watch this film we should not only look for Rome, but for Fellini himself, and todays’ Fellini [...] Fellini’s muses symbolize memory here (a commemoration of war-time Rome), and memories are deformed by imagination (the grande raccordo anulare or ring-road is seen as hell). 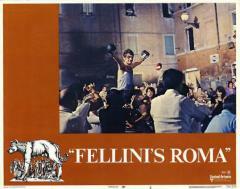 In these episodes [...] Fellini confirms his talent while evoking situations and characters. 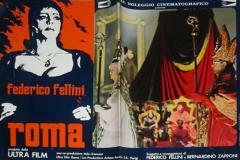 Here Fellini’s own reality [...] replaces reality, becomes reality itself [...] The more you understand the Director’s coordinating effort and the more you consider it over-ambitious. Let’s follow the apparent confusion and perceive unity in such a disorder. 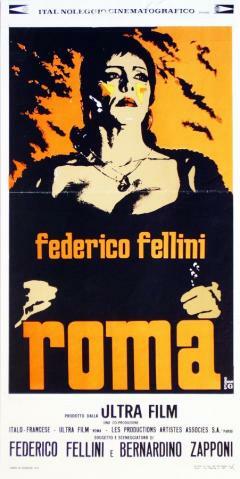 Shots like those on the ring-road, the brothel, the clergy fashion show make up pure cinema. This style mixes up fictional memories and fake chronicle and becomes poetry. In other moments it is a sort of baroque fury combining kitsch, deformed and hideous elements. 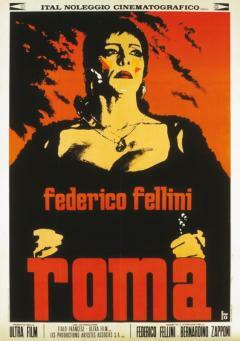 Notwithstanding some lack of balance, the films always attains the goals the director had set himself. He does this while alternating Bosch’s nightmares, Goya’s black horror and Grosz’ scratches. His childhood in Romagna, the arrival at Termini railway station, the guesthouse (“pensione”), dining in small restaurants (“trattoria”), brothels - they are all pages of great stylistic virtuosity reminding us of Carlo Emilio Gadda. But even as we look at modern Rome we feel great emotions: the ring-road shot and the end, with the bikers riding at full speed among ruins and ancient buildings. The film has a few flaws: a casual structure, weak links, a few blurred episodes, some scenes that are almost caricatures (the whole clergy fashion show). But it's another fascinating piece of work by one of todays’ greatest artists. 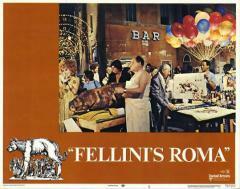 In our opinion, Rome is not as magnificent as La dolce vita and Otto e mezzo, but it is one of the most opulent and funny portraits of Rome. The author’s personality is more strongly expressed, and shows the inventiveness of a talented man. 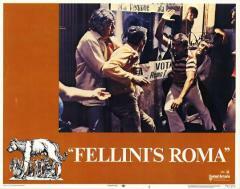 The city depicted in Rome is not the one described by history books, tourist guides or football team fans; it is not Pasolini's crude city or Moravia’s gloomy city. It is a Rome of an artist who made his career and still is like Moraldo in I Vitelloni, an artist who is now trying to illustrate the features of one of most enigmatic and mysterious historical cities. He thus evokes private ghosts and endlessly talks to his friends at cafés.